This growing campaign encourages people to increase their intake of fruits, vegetables, whole grains, and legumes, and dietitians are embracing it as a tool to promote healthful eating patterns. What do Oprah Winfrey, Michael Pollan, and Mario Batali have in common? They’ve all jumped on the Meatless Monday bandwagon. Hospitals, colleges, restaurants, magazines, foodservice companies, workplaces, and entire communities are pledging their support for the program, too. What’s Meatless Monday all about? It’s a nonprofit initiative of The Monday Campaigns, which is developed in association with the Johns Hopkins’ Bloomberg School of Public Health, with a simple message: By cutting out meat once per week, you can improve your health and reduce your carbon footprint. The initiative provides information and recipes to help people start each week with healthful, eco-friendly, meat-free alternatives. Allison Righter, MSPH, RD, who coordinates the Meatless Monday science advisory at the Center for a Livable Future (CLF), reports that Meatless Monday began in 2003 in response to the release of the Healthy People 2010 report, which included goals to reduce dietary saturated fat by 15%. “Since saturated fat primarily comes from meat and animal products and since one day a week is just under 15% of the week, Meatless Monday was a practical method for helping people to meet those goals. Reducing meat consumption also has many other benefits, such as lowering the environmental burden of industrial food animal production, which is a major focus of CLF’s research,” Righter says. The Meatless Monday message helps people ease into the concept of decreasing animal intake by selecting just one day per week to go meatless. “We’re not asking people to cut out meat from the diet,” Righter says. “This is all about moderation; it’s one simple tool to help people incorporate healthier—and also more environmentally sustainable—alternatives to meat into their diets just one day each week. It’s a platform to introduce new and often overlooked foods, and ideally this will trickle over into other days of the week and ultimately translate into healthier eating habits and dietary patterns over time. Indeed, Meatless Monday appears to be an effective tool for promoting health. A nationwide survey conducted by FGI Research for Meatless Monday found that among those who are aware of the initiative, 36% say the campaign has influenced their decision to cut back or consider cutting back on meat. Of those influenced by Meatless Monday to reduce meat intake, 62% say they’ve tried to incorporate it in their weekly routine; 40% incorporate more meatless meals the rest of the week; 73% eat more vegetables; 64% eat more fruits; 42% eat more beans; 47% eat more whole grains; 50% experiment with new meatless recipes when they cook at home; and 42% try more meatless dishes when eating out. The Meatless Monday movement has grown dramatically in the past two years. Awareness of the campaign primarily is due to grassroots viral dissemination and support of participating organizations rather than advertising. According to the FGI Research survey, public awareness of Meatless Monday increased from 26% to 43% from November 2010 to July 2012. Meatless Monday has more than 35,000 Facebook likes and 18,000 Twitter followers as of July 2012. In addition, many organizations, such as the Food Network (more than 3 million Facebook likes and 1 million Twitter followers) and the Cooking Channel (more than 345,000 Facebook likes and 87,000 Twitter followers), post Meatless Monday content every week. High-profile chefs and restaurants have helped bring Meatless Monday to the forefront as well. “In the beginning, Meatless Monday was started in restaurants by pioneers like Mario Batali. Now it’s gone mainstream,” says Neu, who reports growing innovation in the restaurant world. Chefs are employing food stations, special menu features, and tasting menus to help promote Meatless Monday. Dietitians are getting excited about using Meatless Monday as a tool in various work settings. 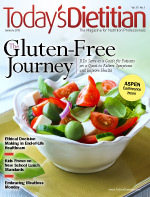 “Dietitians are involved in marketing, cooking classes, community, television, cooking demos, and blogs. They’re also involved in foodservice settings,” Neu says of the many ways dietitians use Meatless Monday to provide healthful eating messages. “It’s one strategy to help bring Americans in line with the Dietary Guidelines. Everyone’s on the same page; we’re all struggling to get people to eat more healthfully. Using Meatless Monday is an opportunity to introduce these plant-based foods, like vegetables, fruits, beans, and whole grains. That’s one of the things that came back from our survey of dietitians. They believe Meatless Monday provides an opportunity for people to try new recipes and new foods,” Righter says. Roberta Anding, MD, RD, LD, CDE, CSSD, director of sports nutrition at Texas Children’s Hospital in Houston, uses Meatless Monday as a tool in teaching an introductory nutrition course. “It dovetails with my lecture on vegetarian nutrition. From a clinical perspective, I use it to reduce the high calorie burden of my carnivore Texans. I’m contemplating writing about it for the Houston Texans Gameday magazine,” she adds. Natalie Bates, a clinical nutrition student at the University of California, Davis, spent the past summer in an internship at Kaiser Permanente San Diego Medical Center, where she created, promoted, and implemented a Meatless Monday program for the cafeteria. To kick it off, Bates created a presentation that was shown on the TV in the hospital cafeteria. She tested meatless recipes and worked with the chef to offer four different meatless entrées in the cafeteria on Meatless Monday. Bates made table tents that included recipe pictures and environmental and nutritional information. She also set up a table at the cafeteria entrance that showcased a poster promoting the campaign and that provided staff to answer people’s questions. If you’d like to use Meatless Monday in your own practice, MeatlessMonday.com offers many great resources to get you started, such as information on nutritional and environmental benefits, articles, a recipe widget that can be placed on any website or blog, and a tool kit with promotional materials in a downloadable format. So go ahead, jump on the Meatless Monday bandwagon and encourage your clients to take the ride for better health, too. — Sharon Palmer, RD, is a contributing editor at Today’s Dietitian, a freelance food and nutrition writer in southern California, and author of The Plant-Powered Diet. 2. Craig WJ, Mangels AR; American Dietetic Association. Position of the American Dietetic Association: vegetarian diets. J Am Diet Assoc. 2009;109(7):1266-1282. 3. Newby PK, Tucker KL, Wolk A. Risk of overweight and obesity among semivegetarian, lactovegetarian, and vegan women. Am J Clin Nutr. 2005;81(6):1267-1274. 4. Micha R, Wallace SK, Mozaffarian D. Red and processed meat consumption and risk of incident coronary heart disease, stroke, and diabetes mellitus: a systemic review and meta-analysis. Circulation. 2010;121:2271-2283. 5. Pan A, Sun Q, Bernstein AM, et al. Red meat consumption and risk of type 2 diabetes: 3 cohorts of US adults and an updated meta-analysis. Am J Clin Nutr. 2011;94(4):1088-1096. 6. Cross A, Leitzmann MF, Gail MH, et al. A prospective study of red and processed meat intake in relation to cancer risk. PLoS Med. 2007;4(12):e325. 7. Baroni L, Cenci L, Tettamanti M, Berati M. Evaluating the environmental impact of various dietary patterns combined with different food production systems. Eur J Clin Nutr. 2007;61(2):279-286. 8. Hamerschlag K. Meat Eater’s Guide to Climate Change + Health. Environmental Working Group website. http://static.ewg.org/reports/2011/meateaters/pdf/report_ewg_meat_eaters_guide_to_health_and_climate_2011.pdf. July 2011. Accessed May 10, 2012.